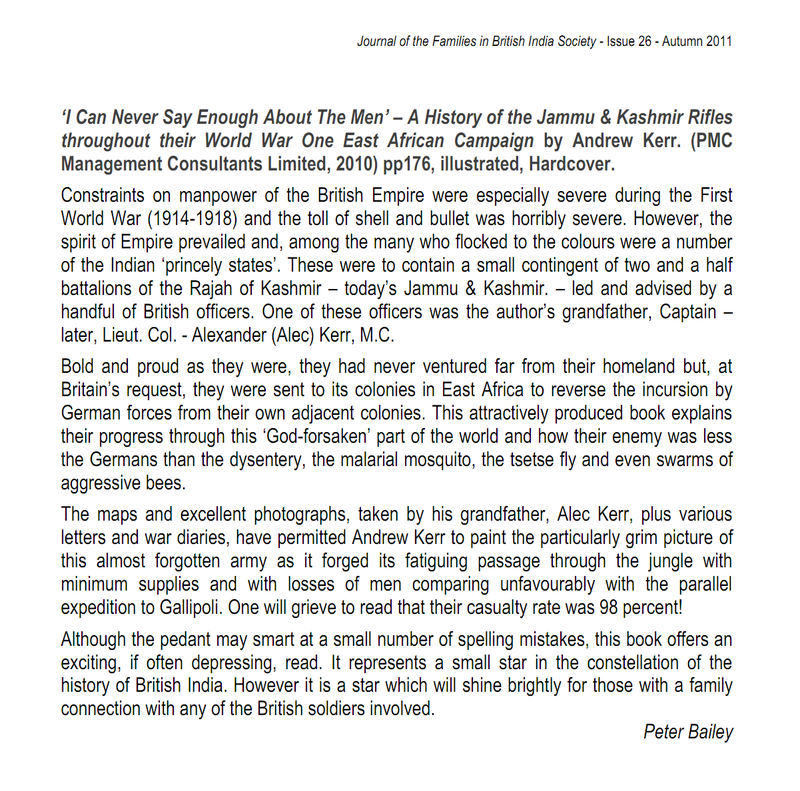 I recently purchased two copies of your book on the history of the Jammu & Kashmir Rifles during the Great War. It was such a pleasure to go through it. I was particularly fascinated by the excellent photographic content. The coverage of the numerous NCO’s and men, both in the images and in the text, make this an almost unique regimental history to be ranked, in my humble opinion, amongst the best in that genre. Incidentally, it was my privilege to put together a battalion history of the erstwhile 38th Dogras (now 2 Dogra). While the battalion lost quite a bit of its records and silver when it went into the bag at Singapore, they still had some interesting photographs, particularly portraits of individual British officers during the pre-war period. I will see if I can find any photographs of your grandfather, although given your excellent collection, I expect you may already have them. Once again, my compliments on having put together such a readable and well-rounded regimental account. “The First World War campaign in East Africa has received little coverage compared to Europe, though The History of the Great War – Military Operations East Africa (London, HMSO) provided an early account and there have been some more recent and extremely valuable works. Similarly, the efforts of the Imperial Service Troops (later Indian State Forces) have received patchy coverage, though the former princely state of Jammu & Kashmir has fared better than others with two exceptionally good books – Major K Brahma Singh’s History of Jammu & Kashmir Rifles (1820-1956) (Lancer International, Delhi 1990) and Major General Monty Palit’s Jammu and Kashmir Arms, History of the J & K Rifles (Palit & Dutt, Dehra Dun 1972). Through these books and my own research, the name of Captain Alexander Kerr, who won a Military Cross in East Africa while serving with 2nd Rifles (Body Guard Regiment) of the Jammu & Kashmir army, and those of other British and Kashmiri officers who served with the regiment, have been known to me for several years. 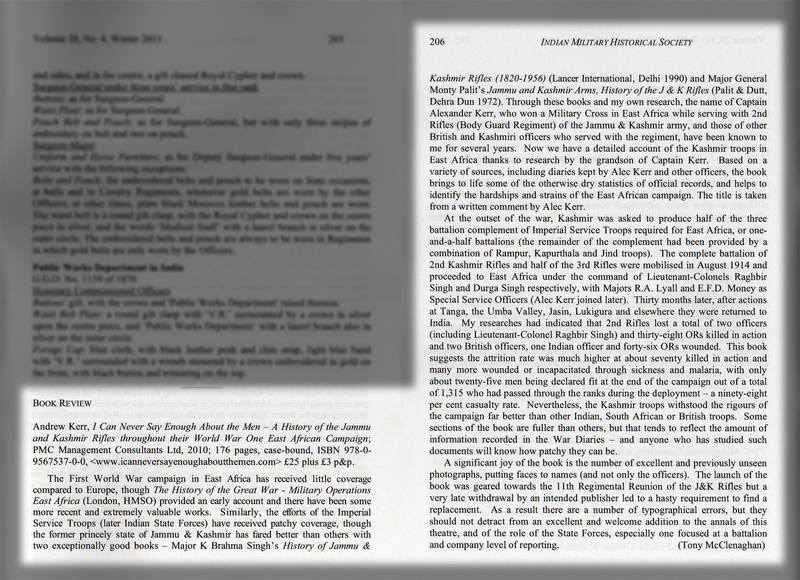 Now we have a detailed account of the Kashmir troops in East Africa thanks to research by the grandson of Captain Kerr. Based on a variety of sources, including diaries kept by Alec Kerr and other officers, the book brings to life some of the otherwise dry statistics of official records, and helps to identify the hardships and strains of the East African campaign. The title is taken from a comment written by Alec Kerr. “This is a pictorial book that contains many relevant Great War photographs taken in East Africa and India. 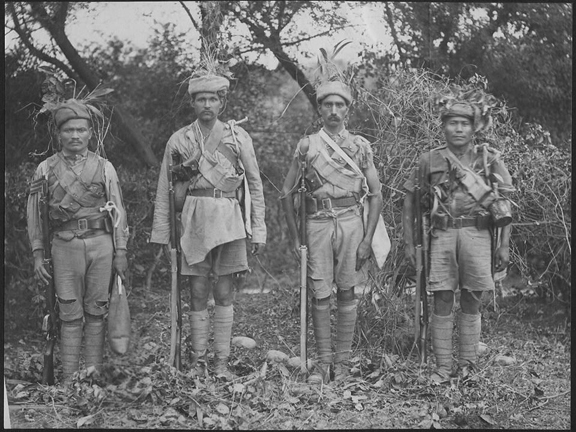 The story uses the diaries and letters of British officers to describe the campaign activities of the 2nd and 3rd Kashmir Rifles during the East African campaign. The book is particularly useful in describing the activities of Indian Imperial Service units during the war. British Special Service officers took over command appointments, in marked contrast to what happened during the Second World War. Management Consultants Limited, 2010) pp176, illustrated, Hardcover. later, Lieut. Col. – Alexander (Alec) Kerr, M.C. “I had noticed in my general browsing of the web that a new book associated with the East Africa Campaign of World War I had been published, strongly titled I Can Never Say Enough About the Men. It did not drift into my orbit, however, and I found no opportunity to read it until I was contacted by Andrew Kerr, the author of the book, with a request to review it on behalf of the Great War in East Africa Association. This I gladly agreed to do and shortly afterwards a copy arrived in the post. At a glance I found a richly illustrated narrative configured along the lines of a standard regimental history that dealt, it seemed, with the East African experience of the Jammu & Kashmir Rifles. It was not until a few days later that I was able to settle down to read it in earnest. “Originally, Andrew Kerr decided he wanted to conduct some gentle research into his family history and to record a distinguished tradition of over 200 years of military service by six generations of Kerrs of Abbotrule in India. The author extended the family record of military service to a seventh generation when he served in the 1970s in the 17th/21st Lancers albeit not in India.